British police have heightened security outside the premiers’ office as hundreds of demonstrators protested the Israeli prime minister’s visit to the country. Hundreds of people attended the demonstration on Tuesday to protest the Israeli occupation of Palestinian lands as UK Prime Minister Gordon Brown held a meeting with his Israeli counterpart, Benjamin Netanyahu in London. The rally began about 30 minutes prior to Netanyahu’s arrival at Brown’s office on Tuesday, Ynet reported. Based on the report, at some point, several demonstrators tried breaching the secured perimeter outside Brown’s office, but were stopped by British police. 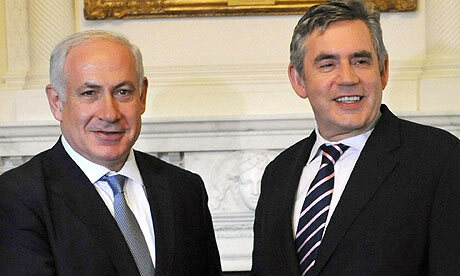 Netanyahu arrived in London on Monday for two days of meetings with Brown and US Mideast mediator George Mitchell. After the meeting the two premiers attended a press conference during which Brown said the demand to halt settlement construction remains in place. The status of Jerusalem has been among the thorny issues in the stalled peace talks between Israel and the Palestinians, with the Israelis claiming the city as their “eternal, undivided capital”– a position not recognized by the international community.